Approx. dimension: 173 x 61cm x 6mm. 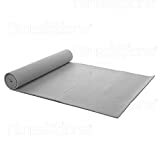 Non Slip Yoga Mat designed with reliability and longevity in mind. Comes in a variety of colours, accommodates all yoga enthusiasts. Can also be used for camping, fishing, resting , picnic, sleeping, etc. Provides support during sit ups and yoga exercise. Reduces impact during exercise.